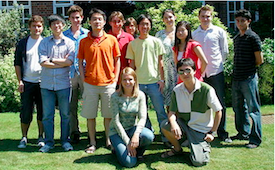 The Cambridge iGEM2008 team project aimed to set a foundation for future research in engineered multi-cellularity by pursuing electrical and peptide signalling, and cellular self-differentiation through spontaneous spatial patterning. 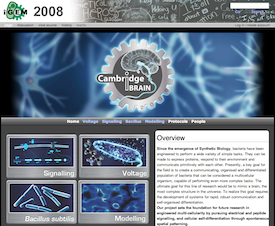 Voltage: In order to simulate neural activity in bacteria, a mechanism resembling a synapse is necessary. At the synapse, neurotransmitter molecules are released from the presynaptic plasma membrane. The neurotransmitter diffuses through the synaptic cleft and binds to chemical receptor molecules on the membrane of the postsynaptic cell. These receptors cause ion channels to open so that ions rush out, changing the transmembrane potential. Attempting to mimic this in a prokaryotic system is particularly attractive as, in a more general sense, it provides an interface between chemical or biological and electrical systems. Using the amino acid glutamate as our 'neurotransmitter', we have successfully demonstrated a voltage response in bacterial cells. Signalling: Using peptide-based signalling systems from gram-positive bacteria, we have laid the foundations for a self-organising biological system, capable of expressing spatial patterns of GFP expression on a bacterial lawn. The focus of our investigation was on a simple two-component Reaction-Diffusion system, allowing for simple spatial 'patterning' of gene expression. The simplest of these patterns mimic the spots and stripes seen on animal coats. In 1952, Alan Turing famously described this Reaction-Diffusion system and suggested it as the basis for self-organization and pattern formation in biological systems. This is a first step in the direction of engineering multicellular behaviour. Bacillus: To build more complex cellular systems, new tools and techniques are required. We are generating standardized parts, tools, and techniques for the gram-positive chassis ''B. subtillis''. Easy to handle and transform, this bacterium offers many adantages to ''E. coli', including the ability to secrete proteins and integrate DNA into the chromosome. 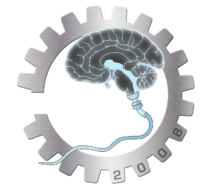 We have designed, built, and submitted gram-positive RBSes, promoters, and shuttle vectors. As a part of this work we have confirmed single copy chromosomal insertion, demonstrated InFusion assembly, and characterized an improved GFP variant. Modelling: We have introduced a model of the AGR quorum-sensing system of S.aureus to illustrate how a typical quorum-sensing system works. The model predicts theoretical values for biological parameters (such as the threshold cell density) that can be verified and we will be also be able to predict how the system behaves if we change a number crucial parameters. This can be extremely useful in informing design decisions when building a synthetic device. We have also expanded this model into a hypothetical setup with a second parallel agr-system. Using this parallel signals model, we investigate how to engineer a biological patterning system.